Q: Were you always pretty goal-oriented? KM: Yeah, somewhat. I set goals and worked my way toward them. There’s always certain goals I set for myself, you know. I think once you do that, success will come. Q: Any other coaches you grew close with? KM: Yeah, Coach Ron Brown. I got real close with Coach Brown because I wanted to switch positions. Because of the communication problems Coach Darlington and myself had, I wanted to go play receiver. (A couple of other guys did, too.) Coach Brown recruited me, he was my point of contact at Nebraska. I got closer to Coach Gill after I graduated. He gave me an opportunity to play some football after I graduated. I went to British Columbia, the BC Lions. I went up there for a mini-camp. I didn’t make the team, but after sitting out a year it let me know that I could still play the game. I had a daughter at home that I had to be around and be supportive of growing up, so I didn’t attack it like I wanted to. Sometimes I still wonder if I could have done a little bit more in that arena, but I’m still glad I had the opportunity that I did. But sometimes it still haunts me, Paul, it’s the question of, ‘Why didn’t I even get invited to the combine?’ We had a Pro Day there at Nebraska and I ran a sub-4.4 40 yards for the pro scouts. And I knew they were interested and I still didn’t get invited to the combine, to show some more skills on a higher level. That question, still today, kind of plagues me and bothers me. If I wasn’t working with kids like I do I would probably go insane trying to figure out why. I just put my energy into the kids, help them understand that even though they may be gifted at some things, nothing is a sure thing. How do you make it through adversity, how can you make it through adversity, you know? How are you going to deal with it? Q: Any special recollections of Coach Osborne? KM: He was stellar guy, man. You know, one of the reasons I could run to him after we won the national championship and take him up and put him on my shoulder was because of the guy he was even before that, before he won the national championship. I always thought he was a classy, cool, laid-back kind of guy, because when he spoke he really and truly meant what he was saying. Through that, it not only helped him be successful in a lot of areas, but a lot of guys around him learned how to be successful. I, myself, being one. Coach Osborne had a lot to do with my growing up from a boy to a man, realizing the changes I had to make when I got there. Coach Tenopir, Coach Solich, those guys, although they were coaching other positions they were laid back and straight forward as well. That staff there was very supportive in meeting my goals and achieving them. Q: What stands out in your memory? Something you’ll never forget? KM: I think it was my second year, having the opportunity to play Florida State for the national championship. And when we went down to Miami we spoke to some kids there. That really stands out because a lot of those kids were, they needed some type of leadership, some type of role models. Myself, Mike Minter, Tyrone Williams, we all went and had a chance to talk to the kids. They had a BBQ for us, and I remember we had to hurry up and eat so we could talk to these kids. I was apprehensive at first, but when I got up to speak I started to realize that this is probably something outside of football that was going to have a grip on me for the rest of my life. And then there was the loss when there was the 1:16 seconds left, where we had Florida State beaten. And knowing that we actually had them beat? That next season we were dedicated after that. The next year after every practice we had 1:16 put on the clock and went that much longer, after every practice, where we dedicated ourselves to finishing our Unfinished Business: “We’ve got unfinished business here, folks.” That really sticks out, because that extra work we put in made all the difference in winning the national championship against Miami in Miami. Q: You were on defense, you were on the punt team, the punt return team as the return man, right? You took some hits! KM: Yeah, kickoff team. They tried to take me off a couple of the special teams because I would be strong safety. But we had a young guy as the backup and I felt that -even though he had the talent- that we might be shooting ourselves in the foot without my experience back there. He had the skills, but he was a young guy. I had to play just about every down that year. It was just something I had to do. Earlier they did take me off those special teams, but when they did the opponents’ stats started going up. So that had to change, and I couldn‘t not be on those teams that I had before. So I begged them to put me back on special teams. I just had a knack for the ball. A lot of times it may seem like I was out of position, but I was blessed with a little quickness, a little speed, to be where I needed to be before the ball got there. Q: I remember one of those punt returns, it seemed like you were outnumbered by about 4 Miami guys yet still managed to squeeze out an extra ten yards of return. Do you remember that? KM: Yeah, I remember breaking Ray Lewis’ tackle. He was a sophomore at the time, but I think he was still second team All-American that year. Q: Any major recollections of the Florida State game, Kareem? KM: I didn’t play much that year. That’s the year I was going through a lot of things, not only at home, but at school. I was wondering if I could even play football at that level. I was standing on the sidelines but I was growing up. That year was really a learning year for me, because going into the fall of my junior year I was projected as a starting corner. I had to really earn that position in spring ball. I was having a good time out there, Paul. And the next fall I rested on my laurels a little bit, and a guy by the name of Tyrone Williams kinda snuck in there and did what he had to do and became the starter, so I had to do some more learning, you know. I don’t like to say I lost my starting position, but I made sure to stay focused and the next year I came back and played every down and never came off the field. I was second team All-Conference AP and Coaches Poll my senior year, third on the team in tackles, second or third in interceptions. It just baffles me how I didn’t get invited to the combine or Senior Bowl game, you know? KM: Oh yeah, Miami talked so much trash in the press, in the paper and all that stuff. Before the game they were telling us how slow we were at defensive back and how we couldn’t stick with them. And it kind of looked like that at the beginning, but once we buckled down and got into the flow of things we were the team to beat that night. We were in the top five in about every defensive category, so that night once we got in the flow there was nothing we felt that we couldn’t do. Once I caught that interception (which I probably could have knocked down because they had the ball on like the 5 yard line), we could have gotten the ball back on the 5 yard line and probably scored again. (laughs) But I couldn’t take a chance on somebody else catching it, so I just had to make that interception and make sure that nobody would take that ball from me until I got up. With some of the receivers running around out there, there was some pride involved there. Q: They were talking a lot of smack out there, weren’t they? Q: Until then, I supposed they were calling you unrepeatable names? Saying impolite things about your mother? KM: Oh yeah, unrepeatable stuff. That’s right. All that. Q: Now Kareem, you say your first fall was ’92, right? Did you ever really buy into the slogans, “Unity, Belief, Respect”, “Refuse to Lose”? Did you buy into that? KM: Oh yeah, we did. And we also came up with a sub-slogan, too. We were walking around saying that we were “Tired of being stepped on.” Because by us going to quite a few championship games we didn’t feel we were getting the respect we deserved. So we used to walk around singing a little tune, ”We’re tired of being stepped on”, like a song, a little chant. And that kind of brought us together even more, along with “Unity, Belief, Respect”, “Unfinished Business” and so forth. Q: No national media respect? Q: What do you think set those teams apart at the time? KM: I think it was focusing on winning. Really focusing on winning. Coming together and doing it every game. One game at a time, of course, but winning every game. Because like I said, we had been successful in so many areas: academics, graduation rate, 9-10 games a season, going to a bowl game… all that was set up for us, so now what? “What do we need to do? We need to win the national championship game.” I think we won the Big 8 4-5 years in a row. The only thing left to do now was win the national championship. I think as a team -coaches and players- we broke it down and came together and really focused on how to do that. Some people in growing up and in business say, “I want to be successful”, the question then is, “How do you become successful? How do you achieve what you set out to achieve?“ We really focused in winning every game, one game at a time, and before you know it we played for the national championship. Two out of the three years I was there we played for a national championship. I think in my 3 years there we lost 4 games. And not to mention the dominance they carried on after I graduated, ’97 and continuing on all those years. One thing that factored into that was Coach Osborne and how he trusted in his staff to get the job done. One of my guys, to this day I love, is Coach McBride. A really hard-nosed, straightforward coach. I just really looked up to him. I don’t think he knew it at the time, but I really latched onto him. Although we may have bumped heads a couple of times, I really saw him as a great male figure at the time. Q: What was it like to bump heads with Charlie McBride? KM: Oh, it was something else. If you’re gonna step in the fire, you better be ready to put it out, because he’s gonna keep you going. Q: I’ve been told Charlie was a unique motivator. How did he do that? KM: Yeah, man, he was. He’d get you ready for a game. Some of the speeches he would give us? Some of the things he would tell us, how “We have an opportunity to make history here, why don’t we go out and do it?” And he had the chew in his mouth and he’d turn red and throw his arms down to his sides and scream at the top of his lungs. You just had to feel it. You just had to feel it. He was the Defensive Coordinator and he’d get us prepared early in the week. He was really good at getting us prepared early in the week, defensively. You knew you were gonna be ready that week. You’d be ready. Q: Was there a specific mindset communicated? KM: Basically, just handle your responsibilities, at full speed. If you mess up, just make sure you do it at full speed. You might be where you need to be even though you made a mistake. And really, just be a man about things. And we used to get together and hang out with the guys all the time. I was the barber, I cut hair. So a lot of guys would come over to my house and get a haircut and we’d hang together and kind of got focusing on one common goal and make sure we could achieve it. Some of the guys who were there, like Calvin Jones and Toby Wright, Trev Alberts, Travis Hill, Kevin Ramaekers? 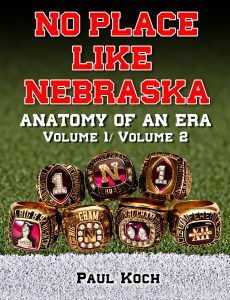 Some of those guys, I wish we could have won the national championship for those guys, and it wouldn’t be Nebraska football without those guys. I hate that we didn’t get them a ring. 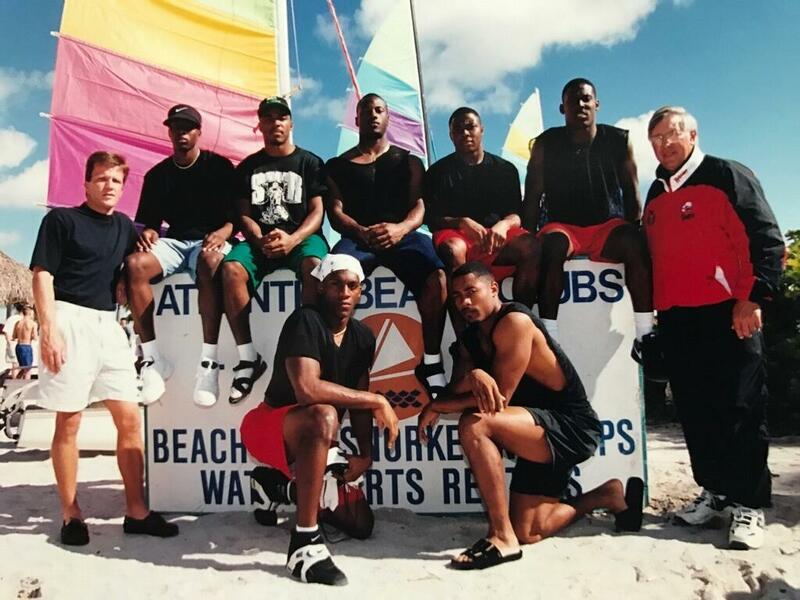 The least that we could do as a team, myself, Mike Minter, Barron Miles, Tyrone Williams, Tommie Frazier, Lawrence Phillips, all these guys, Ed Stewart, Terry Connealy, the least we could do is win it for all those past players. We really were playing for them because they set the tone for us in that era of the ’90’s, the dominance. Those guys had a lot to do with us dominating the 1990’s.